Necon eBooks' e-version of my story collection Christmas Trees & Monkeys is now available for only $2.99 directly from Amazon via your Kindle or from Amazon here, or via your Nook or the BN site here. Of course, you can also order directly from the publisher here. Again, all author proceeds go to the MS Society, so spread the word! 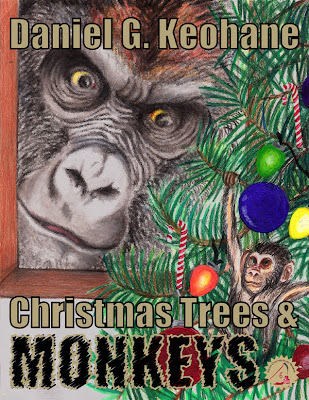 Christmas Trees & Monkeys Now Available as an eBook! 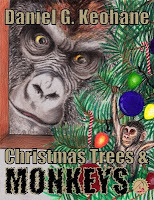 My first short story collection, Christmas Trees & Monkeys, Collected Horror Stories Volume 1, is now available as a Kindle, Nook, what have you, ebook from the fine folks at Necon eBooks! With brand new cover art by the venerable Kelli Jones, the collection is much the same as the original, with minor tweaks in some of the introductions, but for the low price of 4.99, can't beat it. Also, as with the print edition, 100% of author proceeds will be donated to the Multiple Sclerosis Society. Right now the book is available direct fron Necon eBooks, but they'll soon be available directly from Amazon and Barnes & Noble. I'll let you know when they are, but note that we make a better profit if ordered directly from the publisher (who emails you every ebook version directly, which is pretty cool). OK, let me know what you think.